Atomic, molecular and optical physics research at the James R. Macdonald Laboratory. The Kansas State University Atomic, Molecular, and Optical Physics (AMO) program is one of the largest in the country and ranked among the elite programs in atomic physics by US News and World Report. The faculty is funded by a diversity of grants from the Department of Energy, the National Science Foundation, the Office of Naval Research, the Air Force Office of Scientific Research and the Research Corporation. The AMO group consists of nine experimentalists and three theorists who are Physics faculty members. The group also has three experimentalists and one theorist who are Physics research faculty members and in addition has several research associates in both experiment and theory. The graduate students working in the AMO research program are funded by GRA stipends from the research grants and are encouraged to attend national scientific meetings to present the results from their research. We are always seeking new graduate students. The AMO program has a long history of research in ion-atom collision physics dating back to the early 1970's. Broadly speaking, the theme that unites the JRML current activities is the study of dynamical processes involving ions, atoms, molecules, surfaces, or nanostructures exposed to short, intense bursts of electromagnetic radiation. During the period of 1974-2000 this was carried out using collisions of energetic ions from our Tandem van de Graaff and LINAC accelerators, or of slow, highly charged ions from our EBIS and ECR ion sources, with atoms, molecules, clusters and surfaces. 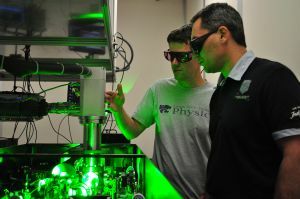 More recently the Lab has added "ultrafast" intense laser facilities (including KLS, the Kansas Light Source, and PULSAR, the Prairie Ultrafast Light Source for Attosecond Research) and hired new faculty to develop and use them. 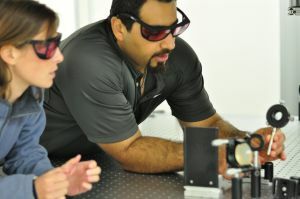 Even though the laser pulses are actually longer than the collision time scales traditionally studied in the JRML and the electric fields generated by the "intense" laser pulses are typically weaker, using the lasers to interrogate the same targets provides one important benefit - control. The time-dependent profile of the laser pulse can be shaped by the experimentalist and addresses all targets within the interaction volume simultaneously. The presence of the the lasers has resulted in a shift in the direction of much of the program away from pure collisions toward intense-laser-matter interactions. A major strength of the laboratory has been the presence of a large number of both experimentalists and theorists working in the same area, often in collaboration with each other. The science is driven by both theory and experiment.